John Souter was born on 4th November 1835, the illegitimate son of John Souter Senior and Isabella MacDonald of Pittmiddle, Perthshire and was baptised eight days later on 12th November. He was a single man who worked as a cattle drover and lived on a farm at Stronchavie. The deserted farmhouse is still there today. He died on either the night of the 2nd March or in the early hours of the 3rd March 1897. He had attended a cattle sale in Moulin and in the evening had left to walk the seven miles to his home at Stronchavie. 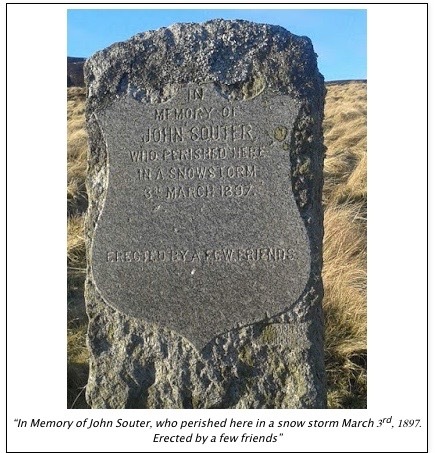 There was a bad snow storm and about four miles from Pitlochry, John Souter collapsed and died. His body was discovered the following day. A tragic story but it is heart warming to know that his friends thought well enough of him to make sure he was never forgotten. This page was added by Pat Townsend on 23/10/2017. There are some interesting articles on the British Newspaper Archive about John Souter’s death, dated 1897, and some later in 1949. He was found in the middle of the road by Alexander Robertson, a Roadman/Surfaceman. Last seen passing Pitarig around 7pm on his way up to the moor. The later 1949 articles state that he was the record holder for the climb up to the summit of Ben-y-Vrackie from Fishers Hotel in Pitlochry and back down again, which he did in 90 minutes! The record was later attempted/timed from the Moulin Hotel, the journey being 2 miles less when it was taken from Moulin. He was apparently well known locally for his feats of endurance. What a man!